What is your earning potential as a real estate professional? It’s an important question to keep asking throughout your career. Real Estate Express’ 2018 Real Estate Agent Income Guide found real estate agent income varies by brokerage type—meaning you can maximize your earnings by choosing a brokerage that’s most likely to boost your profits. Here’s what we know about how your brokerage can impact your bottom line. That depends—not every brokerage is created equal. Each brokerage has a unique set of values, business philosophy and ethos that can impact your experience as a real estate professional. There are quantitative differences between brokerages too. The survey revealed an agent’s income can more than triple depending on the kind of brokerage they’re connected to. 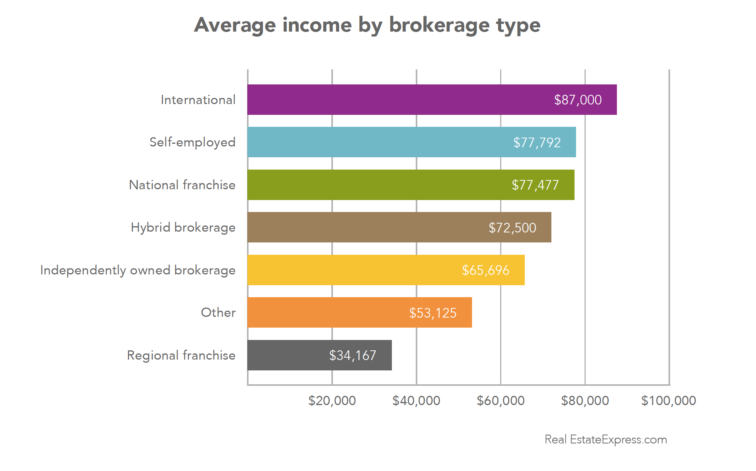 Agents at regional franchises reported annual incomes of $34,167, while agents at international brokerages reported earning $87,000 annually. What do you do if your brokerage isn’t working out for you, or if your earnings seem limited? Well, you can always switch. The survey also revealed that more than half of agents (58 percent) have switched to a new brokerage at some point in their career. 1. Do you receive mentoring from other agents or brokers? If you’re just starting out in real estate, you’ll want to make sure there are more experienced agents around you that can help you find leads, close different kinds of transactions and develop a network in your market. If you’re a woman, you might want to consider joining a brokerage that has a track record of mentoring women in real estate and providing leadership and advancement opportunities for new female real estate agents. 2. Does your brokerage offer any extra benefits? 3. Does your brokerage embrace new trends? The study also shows that agents who stay updated on best practices earn more than double than agents who don’t. Finding a brokerage that has a culture of staying current with technology and strategies will push you to be more innovative yourself, which can have a huge impact on your earnings. Read our entire 2018 Real Estate Agent Income Guide and stay up to date on industry best practices. Additionally, here are some ways to evaluate if a brokerage is a good fit for you. Tom Davidson is the general manager of Real Estate Express, the national leader in online learning for pre-licensing, continuing education and professional development. Tom has nearly 15 years in the real estate industry. From sales training and product development to growing the business, his multi-faceted background encompasses crucial functions to a successful career in the field. For the latest real estate news and trends, bookmarkRISMedia.com.